Barry Bashhore, Inc. knows that in order to provide our customers with a level of service that is second to none, we need to start with safety. Safety is the primary goal in our industry. That is why we hire only drivers that are fully trained and D.O.T. qualified. We make certain that our drivers are educated and trained in proper procedures. Because of our safety programs and qualified drivers this enables us to effectively maintain an accident rate that is well below the industry average. Which in turn means that our customers receive top-notch service. 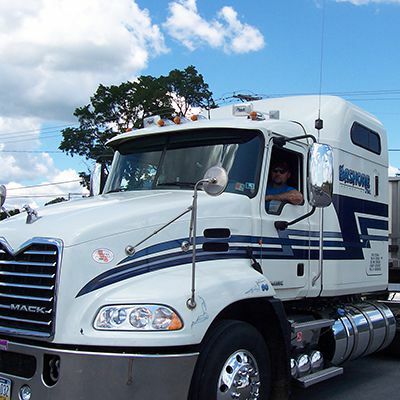 We run a fleet of late model Mack and Western Star trucks that mean fewer repairs, and better dependability. We have both sleeper and day cab tractors to help us get your shipments there on time. All our trucks and trailers are on a preventive maintenance schedule that helps keep our equipment on the road and in compliance with strict D.O.T. regulations. Our equipment is maintained by our own service department, which means less down time for all our equipment and enables us to better serve our customers. We run mostly flatbed trailers, but we also have a few van trailers, a couple of dump trailers, several step deck trailers, a detachable low boy trailer and a stretch trailer. Our drivers are assigned to a specific tractor and help our service department maintain the equipment. Our drivers take pride in the appearance of their tractors and enter them in local truck shows during the summer months. We take pride in our equipment and in our safety record, but we truly believe that our greatest strength is in our drivers. They are the key to helping us maintain our level of professional service to all our customers.